The seat belt use rate among motor vehicle occupants was 88.8% in 2017, which demonstrates an increase of 0.9% from the 2016 rate of 87.9%. 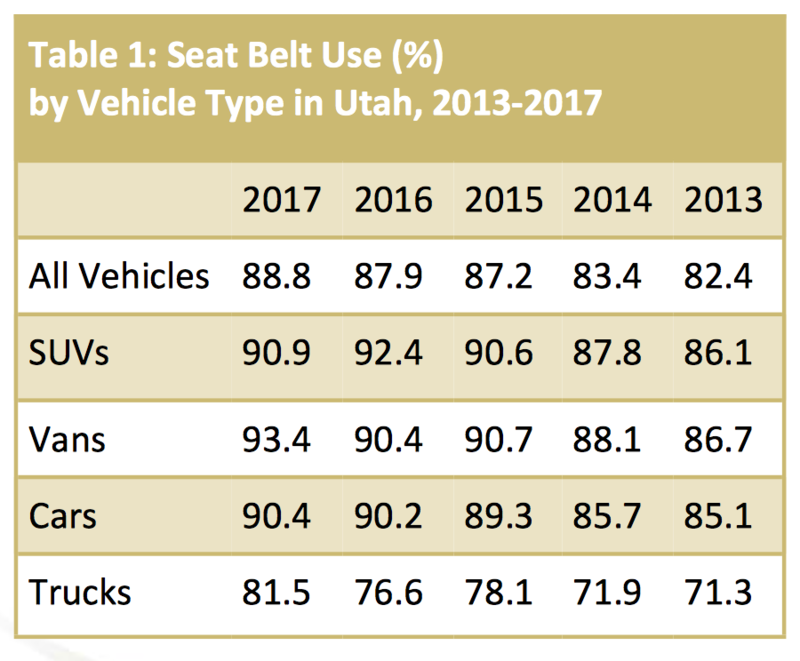 Since the implementation of the primary seat belt law in May 2015, Utah’s seat belt use has increased 5.6%. 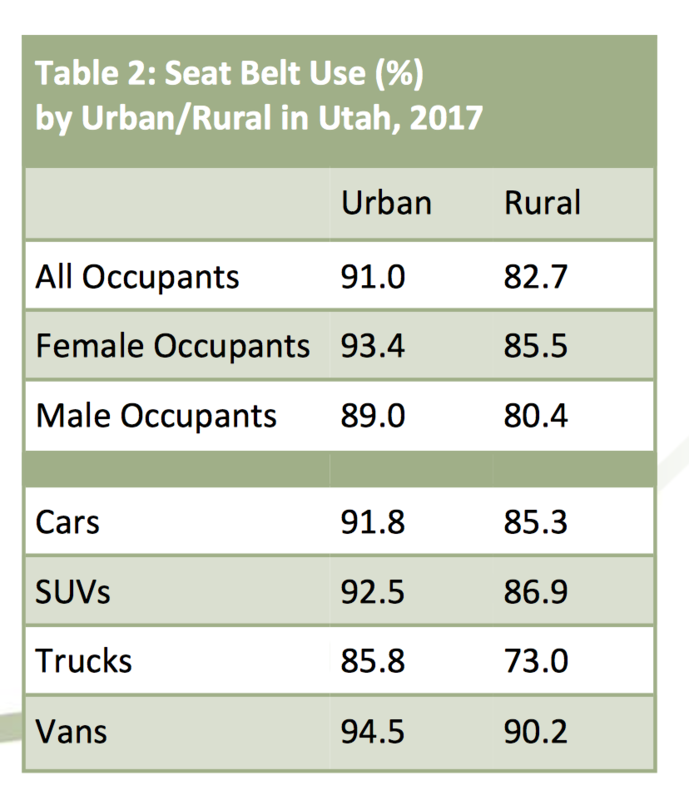 There continues to be significant differences in the rate at which males and females and urban and rural drivers buckle up. The National Highway Traffic Safety Administra on (NHTSA) requires states to conduct observa onal surveys annually to determine the level of seat belt use. The 17 counties selected for observa on in Utah were: Box Elder, Cache, Carbon, Davis, Grand, Iron, Millard, Salt Lake, San Juan, Sanpete, Sevier, Summit, Tooele, Uintah, Utah, Washington, and Weber. The study was conducted June 5-17 during which a total of 31,724 vehicle occupants, including 24,526 drivers and 7,198 outboard passengers, were observed. Thirty-six percent (36%) of the observed vehicles were cars, 31% sport u lity vehicles (SUV), 26% trucks, and 7% were vans. 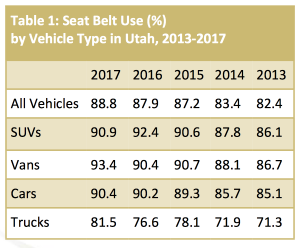 A significant change took place on May 12, 2015 with the implementa on of a primary seat belt law in Utah. The observed usage rates increased .6% from 2012 to 2013, 1.2% from 2013-2014, 4.6% from 2014-2015, and 1% from 2016-2017. 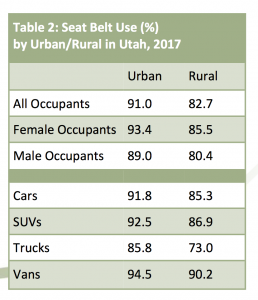 With the other variables being equal from year to year, the logical conclusion would be that the enactment of Utah’s primary seat belt law was responsible for the significant increase in seat belt usage in 2015 – 2017.